So, it got me to thinking: What is the cause of this ubiquitous marketing tactic and, for most who are in desperate need of more quality leads in their sales funnel (in order to grow enrollments), is this a good use of their marketing dollars? Everybody’s doing it, so we would be at a competitive disadvantage if we didn’t! We’re just going to where we think our target market is. Our (insert name of influential administrator or board member) hated seeing our competitors in the airport, so we had to do it. Unless you enjoy the luxury of already having more leads than you can handle (I’m looking at you, top 5 global business school brands! ), I’m not sold on any of these as valid reasons to be marketing in airports. Most realize quickly that the “everybody’s doing it” rationale doesn’t hold up well under any pressure. The target market idea sounds good, until you realize that the target market for MBA programs is very similar to that of other high-priced product categories, most of which either do not advertise in airports unless there is a store in the concourse where a purchase can be made immediately. The institutional leader mandate sounds like the toughest to overcome, but I’ve yet to find one that likes spending precious resources on something that’s likely to be frivolous. With a little pushback (and the data to back it up), that can be overcome. As for the airport signage filling “branding” role in a media spend, first we’d ask: Are you currently getting enough leads into your programs? If the answer to that is no, then we’d probably start with ensuring your “lead nurturing” spend is getting the leads necessary to fill your seats, before moving on to any “branding” spend. Even forgoing, say, $10,000 to have signage in the airport (which is on the low end of the spends we’ve seen) might mean dozens or more leads that are moved from your CRM to that of another institution, since your “lead generation” marketing tactics, such as digital marketing, did not have the budget to be visible to those candidates, and your competitors’ did. Some of those should turn into enrollments if everything in your enrollment growth strategy is functioning as it should. One final note, you’ll notice that one answer isn’t on the list of reasons to be advertising in airports: Because we know it works. Having looked through the CRM source codes on the leads generated at many of these institutions, I can attest that “airport signage” has come up a handful of times, at best, which leads to how I view our role at Eduvantis in helping our clients navigate this airport signage arms race. The thought behind airport signage is a good one – “Let’s be where our prospective students are!” – but there are so many more variables that need to be considered before putting down what can be a significant portion of one’s market budget towards this one tactic. 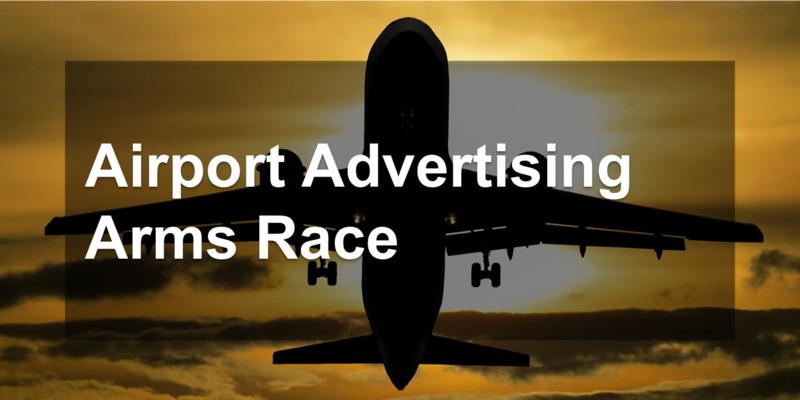 If you’re one of those contributing to the airport signage arms race – and potentially starving your lead generation efforts as a result – know that you’re not alone, but you can do something about it. Make the case internally that there are better uses for this money – a case we’ve helped many of our clients make. You’ll feel great about the decision when your competitors are duking it out for that big sign near baggage claim and you’re just worried about the quality of the Wi-Fi on your flight because you have a lot of leads to work through your sales funnel! As always, if you are curious to know more about how we approach (digital) marketing strategies and reporting, send us a note and we will set up a time to talk soon.